I'm happy to share with you my second project for Smoothfoam! What I loved about making this clock (besides the fact that it was easy and fun!) was being able to gather some of my favorite stickers, stamps, bottle caps, game pieces and other ephemera into pretty clusters all around the clock face. Here are what you need to make this clock. You can give the clock your personal touch by adding more of your favorite embellishments. 1. Paint disk with two coats of Buttermilk; allow to dry. 2. Paint half-heart with two coats of red; allow to dry. 3. Refer to the photo (click to enlarge) to stamp the disc with clock and bird stamps. 4. Rub the edges with distress ink and a sponge. 5. Embellish as desired—be sure the elements do not block the path of the clock’s hands. 6. Attach a clock movement following the kit directions. Love your blog! 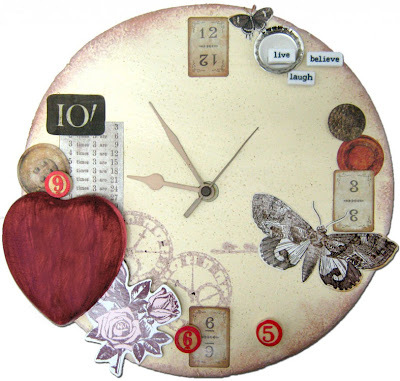 Antique clocks truly are beautiful!